The response to the Prime Minister’s speech on Tuesday (transcript here) has been divided into two distinct camps: the professional political analysts and the public users of social media. The analysts want to dissect the content and calculate the political consequences – they seek to provide a thoughtful response. Many of those who took to twitter and facebook and youtube to respond did so from a totally different place – they wanted to express their emotional responses to what they feel is a under-acknowledged reality. And it is their responses that, I believe, give us a better reading of our culture. Let’s set aside for the moment any discussion of politicians and definitions of terms (is Tony Abbott a “misogynist”? is Julia Gillard a “hypocrite”?). Such a discussion would assume, incorrectly, that words and speeches are mostly about information rather than about communicating feelings and ideas. This is a rookie mistake. The kind of mistake made by a newly-wed who responds to an emotional outburst by their spouse with a hyper-rational response to their words and a tin-ear to their feelings. (Been there; done that!) People want their heart to be heard more than they want their words to be understood. The social response to the Prime Minister’s speech heard her heart more faithfully than many tin-eared analysts heard her words. The response suggests that Julia has given a voice to the feelings and frustrations of many women. Yes, they have succeeded in previously male-dominated areas but they have done so at a personal cost and by keeping silent in the face of unintentional and intentional prejudice. The success of women like our Prime Minister does not mean that we have achieved a level playing field in our culture. Her success might make a good debating point for those with a tin-ear; but her heart-felt speech, and the resonance it has found among other women, says that those who have not walked a mile in her heels need to reassess their confidence that we are a society that rewards and celebrates ability fairly and without gender bias. My interest in this issue is not unconnected with my role of educator of the next generation of church leaders. Some churches claim the right to prejudice, despite the teaching of Jesus (e.g., Luke 10:38-42) and the practice of the early church. Other churches that claim to acknowledge and celebrate the gifts of the Spirit, irrespective of the gender of the person on whom they are bestowed, still treat females in a way that causes frustrations and hurts. Our female leaders don’t talk about it often. They have learnt to “keep silent.” But what if those like me – white, middle-aged, middle-class, over-educated males, with institutional power – were to “welcome” those unlike us, “not for the purpose of disputation” (echoing Rom 14:1-15:12) but so that we might truly experience “unity in the one who welcomes us all.” But to do that we would need to stop defending our practices and claiming to be unfairly misunderstood when our insensitivities are exposed. We would need to stop listening with our tin-ears and start listening with our hearts. Miracles and exorcisms are not proof that Jesus is God. The Bible and history confirm that there have been other miracle workers and other exorcists and no-one claims that this must mean they are divine. No; it is the cross, the resurrection, and Pentecost that confirm Jesus’ identity as the unique Son of God. Miracles and exorcisms are proof that the Kingdom of God is present and that all powers that would challenge God’s right to rule his creation have been defeated. The climax of Jesus’ defeat of all anti-God powers is paradoxically at the point in which they appear to be most triumphant – the cross! It is as the “slain lamb” that Jesus, “the lion of Judah,” defeats his foes. We need to remember this as we consider what kingdom victory looks like. Jesus’ miracles and exorcisms demonstrated that the kingdom of God was now present in his arrival. His actions proved that “the strong man” had been bound and that all spiritual forces opposing God were defeated (see Mark 3:20-30). Today miracles and exorcisms remain proof of the kingdom’s presence. It remains true that their occurrence is most often found when the gospel is advancing into areas and cultures that have not yet experienced the light of Christ. This is why, in my view, pioneering missionaries have more miracle stories to tell than Christians in a churched culture like Adelaide. Often, for us, the way of the cross is about witnessing through endurance (what Revelation calls martyrdom). But there are times when the clash between God’s kingdom and evil is such that the signs of the kingdom’s presence – miracles and exorcisms – are manifested to the glory of God. 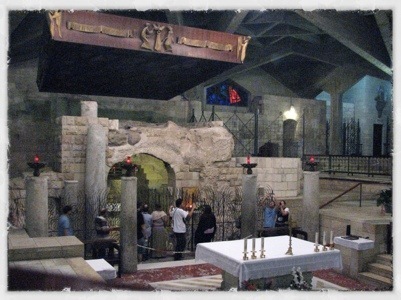 The Church of the Annunciation in Nazareth claims to be built upon the site where an angel appeared to Mary and announced the miraculous conception of Jesus. I was there in June with a group of students from Tabor Adelaide who were exploring the “Contexts of Jesus.” There is evidence of Christian worship at this site since the fourth century. The current church building is a magnificent two-story structure that was built in the 1960s with money from Roman Catholic churches around the word (who have also provided interestingly different art work of the Annunciation that is located around the church). It is the largest Christian church in the Middle East and its dome is 55 meters high. Given the number of pictures taken it was clear we found this all very interesting. But what is the significance of this for us as students of the New Testament and as followers of Jesus? As I took my picture of the Grotto with the Byzantine foundations and the Crusader ruins all encased within a grand modern church, I could not help but see the layers of church traditions that overly the original stories of Jesus. The original truth is there but it has been colored and shaped by different Christian cultures and dramatic world events. Our choices seem to be three. We can so admire the beauty and impact of the current church that we don’t care that it has encased the original within its walls. We can reject all hope of finding the original because of the layers that stand between us and it. Or we can join those who are engaged in the excavation work, finding the bedrock of the tradition, and using the prettiness of the church to draw people towards the original sites. I choose option three. There is much current scholarship going on that helps us to re-hear and re-see Jesus of Nazareth in his context rather than ours. But non-Christians won’t find that Jesus in scholarly books; if they are to find him they will find him in the churches of today. That is why it is our churches that must take seriously identifying and presenting the genuine, historic Jesus of Nazareth in its teaching, its worship, and its practices. What the baby Jesus can teach us about God. Is the line from the song “fullness of God IN helpless babe” (sung in church this morning) an adequate expression of the Christian doctrine of the Incarnation? I think not. I would think a better way of capturing this doctrine’s intent would be found in a simple rephrasing, “fullness of God AS helpless babe”! Before you roll your eyes (ok – too late – after you have rolled your eyes) and see this as final proof that I am way too pedantic give me two paragraphs to express the difference. The image I am left with from the song line as written is of the helpless babe as a shell within which the fullness of God is poured. I marvel that God can fit himself within such a shell and I am awed by his humility. However, my view of God remains unchanged because the shell and the presence remain separated, two distinct and separate realities: one, the fullness of God; and the other, the helpless babe. In my understanding of Incarnation God became flesh and dwelt among us. That is, to pick up the image of the song, the helpless babe was the fullness of God in our midst. This is a radically different revelation. Can it be true that the fullness of God can be incarnated as a helpless babe rather than as a powerful king? Can the fullness of God be that dependent? Can the fullness of God be that vulnerable? Is God really that kind of risk taker? These questions move me beyond marveling and being awed to having my view of God radically transformed. This takes seriously Paul’s claim that Jesus is the image of the invisable God! The baby Jesus is not the steely power of God wrapped in a velvet glove of flesh. The baby Jesus, in all his weakness and vulnerability, is God in our midst. I am not saying that God remains as a helpless babe; this is not the full gospel story. I am saying that if our view of God’s fullness cannot accommodate the fullness of God AS helpless babe then it is more likely that we are getting our theology from the religions of the world than from the gospel of Jesus. This revelation is present in the cross too. The cross shows that God’s power is expressed in weakness and vulnerability. Our God is a great big God (we sang that too). But his greatness and his bigness does not mean that he is unable or unwilling to express himself in smallness and weakness. Now that is a great big God that is beyond our imagination; not the kind of god we would create for ourselves. That is why we need to take seriously the Incarnation as God’s self-revelation. Only in Jesus will we be able to discover God as he is rather than god as we would expect him to be. I was in a meeting recently in which the following prayer was shared. I though it a prayer suitable for every person who is in ministry. So I am posting it both as my prayer for you and so that it can become your prayer for yourself. It is usually attributed to Archbishop Oscar Romero; but according to the National Catholic Reporter it was originally written by Ken Untener and used by John Cardinal Dearden in November of 1979 in a homily at a Mass for deceased priests. We all have experiences that shake our faith. There are times where we have questions for God’s plan relative to us — (laughter) — but that’s precisely when we should remember Christ’s own doubts and eventually his own triumph. Jesus told us as much in the book of John, when He said, “In this world you will have trouble.” I heard an amen. (Laughter.) Let me repeat. “In this world, you will have trouble.” (AUDIENCE: Amen!) “But take heart!” (Laughter.) “I have overcome the world.” (Applause.) We are here today to celebrate that glorious overcoming, the sacrifice of a risen savior who died so that we might live. And I hope that our time together this morning will strengthen us individually, as believers, and as a nation. Life is busy. Often life is too busy. We know that in the frantic effort to keep up with all the things we have to do we often neglect the things we want to do; those things that are important to us but we just can’t find time for. These important things relate to our families, our friends, our communities, and to our souls. This is why religious festivals like Easter have always played an important part in the life of the Christian church. They are times for us to stop being busy and start giving our attention to some of the important things that we have been neglecting. What I would like to suggest is that even if you already have “booked” this Easter weekend with catch-up stuff (such as assignments, odd-jobs, and family time) that you find some time to also catch-up with God. Book it in. Perhaps it means attending an Easter Service with family and friends. Perhaps it means getting away from everything for an hour of “God and you” time. Perhaps it means missing the first half of a footy game. However, you do it, find space to give your attendance to Easter. Easter is a time of renewal and of promise. With the Resurrection of Jesus, God has made all things new. The Apostle Paul calls the Resurrection of Jesus the beginning of the “New Creation.” A New Creation that we are a part of. But as we look around us, things do not seem to be showing the signs of newness that we would expect. Has God’s promise fail? No! The Resurrection of Jesus is proof that God cannot be stopped; even by hate and death. Renewal and Promise. That is something worth taking time to consider this Easter. 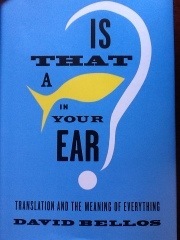 After reading David Bellos, Is That a Fish in Your Ear: Translation and the Meaning of Everything (Faber and Faber, 2011), it is clear that EVERY translation involves the making of choices about translation philosophy. Should the English language choices of the translators draw upon the very best of the English language in order to create in the reader a sense of the majesty of the God we worship? That is, should our English Bibles be more akin to the great Cathedrals rather than the utilitarian, multi-purpose buildings we more commonly worship in? Despite this being a reason why some still prefer the Shakespearean richness of The King James Version of 1611 it is a question easily answered in the negative. The English used in our translations need to be the English of the ordinary (non-churched) person because the New Testament was not written in the classical Greek of the elite and the philosophers but in the koine [common] Greek spoken by the common (often illiterate) people of the marketplaces. A good translation needs to capture the feel of the language not just its meaning. A more complicated question relates to how “foreign” the New Testament should sound to our ears? Clearly it was “native” to the first readers and the goal of a translation like The Message or The Good News Bible is to have the text sound equally natural to contemporary readers. However, this can hide the fact that the first hearers understood the cultural contexts and religious concerns addressed in the text and we do not. A good translation should remind us that we are reading a text which speaks afresh to us but whose context is a first-century Jewish/Greco-Roman culture. Bellos discusses Bible translator Eugene Nida’s use of “dynamic equivalence” – in which an attempt is made today things with “roughly the same force in the culture of the receiving society” (p.170). A classic example is the re-identification of a fig tree as a banana tree for the Sumatrans who had never seen a fig tree. Bellos criticizes this for it assumes that the receiving culture cannot be taught what a fig tree is. “Nida’s position is not popular among translation-studies scholars.” More common today among translators of the Bible, e.g., the Context Group of the Society of Biblical Literature, is to restore the foreignness of the Bible because it “is not a Western Book” (p.178). Is a word-for-word translation such as the English Standard Version preferable to a more dynamic, thought-for-thought version such as the New Revised Standard Version? Not usually, for “It’s an awkward fact for translation studies, but the truth is that meaning does not inhere solely to words” (p.72). Bellos writes, “Few commentators on translation have ever come out in favour of literal or word-for-word style” (p.103). Should we despair because there is no translation that matches the experience of reading it in the original language? CERTAINLY NOT! Reason 2: There are so many scholarly aids and commentaries available that explain culture and context that we can fill-in the unwritten parts of the text in a way that a translation cannot. David Bellos knows about the science and the art of translation. He has won awards for his translations and is the director of the Program in Translation and Intercultural Communication (Princeton University). And he has put his thoughts on translation into Is That a Fish in Your Ear: Translation and the Meaning of Everything (Faber and Faber, 2011). The title, which is an allusion to the sci-fi comedy cult classic The Hitchhiker’s Guide to the Galaxy, shows that the author has a sense of humour and is going to make what could be a dull topic into a very readable exploration of how we communicate across language boundaries. Given that all of us read the Scriptures in translation (the few in the world who read it in the original languages don’t read my blog!) this topic should be of keen interest to us all. Bellos starts by asking “what is a translation?” (ch. 1) but it is not until the end (ch.31) that he offers us a working definition. “[F]or a repeated utterance in a different natural language to count as a translation of the source, it must give us the same information and have the same force… [S]ameness of information and force is a widely respected norm for the translator’s art” (p.319). In between question and answer he explores the meanings of meaning and the various issues that all translators wrestle with. And it is this insight into the translator’s art that makes this a worthwhile read. As users of a translated text it is easy for us to forget that we are reading a translation and that translations (without exception) “always provide an interpretation of the source” (p.321). “No translation is the same as its source, and no translation can be expected to be like it’s source in more than a few selected ways… If meaning and force are kept the same and if in a limited set of other respects a translation is seen to be like its source, then we have a match… [W]hen we say a translation is an acceptable one, what we name is an overall relationship between source and target that is neither identity, nor equivalence, nor analogy – just that complex thing called a good match. That’s the truth about translations” (p.322). Even if we all learnt koine Greek, Hebrew, and Aramaic, we would never become native speakers of them. We might be able to learn them well enough so that we could translate the original texts for ourselves (I’ve tried and failed!) – but they would still be translations! There is no getting around the use of Bible translations so we would do well to understand the art and science of translating texts. Bellos helps us do that. Does God’s Plan for You Need an Adjustment? IF God has a plan for our lives AND IF we have some level of free-will THEN how does he keep us on the right track? 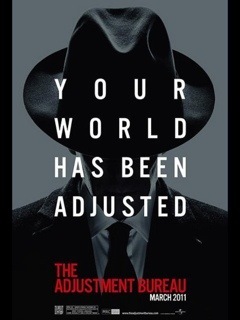 This is the question behind the 2011 film, “The Adjustment Bureau,” in which “angels” are deployed to manipulate our experiences – e.g., a spilt cup of coffee, a missed bus, a chance meeting – to ensure we stay “on the plan.” In the world of the film there is a place for chance – e.g., the premature death of a mother – and the angels are not allowed to force us to do things we do not want to, but even with these limitations they are (mostly) able to keep us on plan. This conflict between fate, destiny, predestination, and God’s will (call it what you will) with chance and free-will has been the source of many stories, ancient and modern, as well as much philosophical, scientific, and theological debates. Do we have a free-will or is our sense of personal freedom an illusion? Do we have a destiny or are we writing our own ever changing script with each choice we make? I don’t believe we can be and do anything we might want to. Our heritage, genetics, culture, and health limit our options. Born in Scotland I was never going to President of the USA and, for too many reasons to list here, I was never going to be a renowned dancer or choreographer. But I do believe that I am where I am today because of choice – some good and some not so good. Does God have a plan for my life? The biblical answer is yes but not in the way “the Adjustment Bureau” suggests. God’s plan relates to my character not to my life choices, either career or spouse. It is God’s will for me that I be conformed to the image of his son Jesus. To achieve this he has not deployed a team of angels to manipulate me but, and this is much better, he has given me his Holy Spirit. This, in turn, will determine what kind of worker and what kind of spouse I will be. The question, Am I “on plan”?, is answered not by identifying where I am or what I am doing. It is answered by who I am. Am I being increasingly conformed to the character of Jesus? Am I producing the fruit of the Spirit? It is not a change in jobs or spouse that will achieve these things and get me back on some pre-determined plan. It is only through humble obedience to the Lord Jesus and a daily walking by the Spirit that I will be kept on plan; and that requires me to make some real choices.